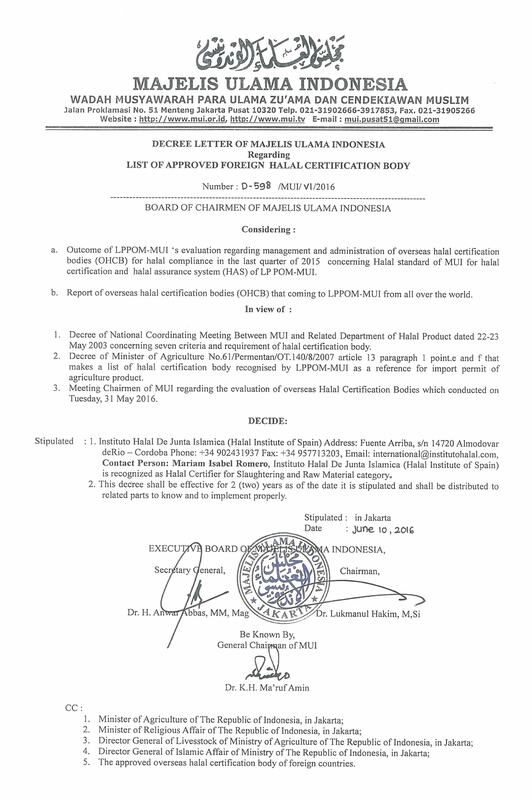 LPPOM MUI recognize halal certificates issued by approved halal certification body only for product produced in the country where the halal certification body located, except for product produced in Europe can be used halal certificate by any approved halal certification body located in Europe. There are still possibilities for LPPOM MUI to ask supporting document to clarify the critical points of certain certified products. The MUI decree regarding list of approved foreign halal certification body is effective for 2 (two) years as of the date it is stipulated and it will be monitored and evaluated once a year. There are 43 Halal Certifier Bodies approved by LPPOM MUI from 25 country, contain 33 bodies approved for (cattle) slaughtering category, 38 bodies approved for raw material category, 17 bodies approved for flavor category.